Every year we host a holiday party in the cafeteria at school! We were able to have some hot chocolate with whipped cream and sprinkles which tasted incredible :) Each best buddies pair also brought some cookies. Buddy pairs had the option to decorate cookies if they wanted, and we even had some time to decorate paper bass with markers and colored pencils that they'd end up taking home with come treats! Obviously there was an ugly sweater contest, and the person with the ugliest sweater got to take home a prize, too, which was a mug that even said "Ugliest sweater fist prize" on it, Altogether it was a great night of festivities! Instead of the usual Barnaby's, best buddies went bowling this month! Some went on the 17th and others on the 24th. Since we're such a big club this year, We were lucky Arlington Lanes could "spare" two nights (no pun intended...okay, maybe there was;)). Even though our group was split in half, the fun sure wasn't! There were nothing but smiles at both events. The granny roll and backwards through the legs were pretty famous. And even with that, the buddies were still getting higher scores than their peers! There is some pretty big bowling talent in our club. Who knew?! Some used bumpers; others didn't. Some even got munchies. Everyone shared one thing in common though, and that was the amount of fun they were having! I've never seen so many strikes in one night of bowling before! In between turns was a great time to chat and catch up with our buddies, and all in all, it was truly a great time! 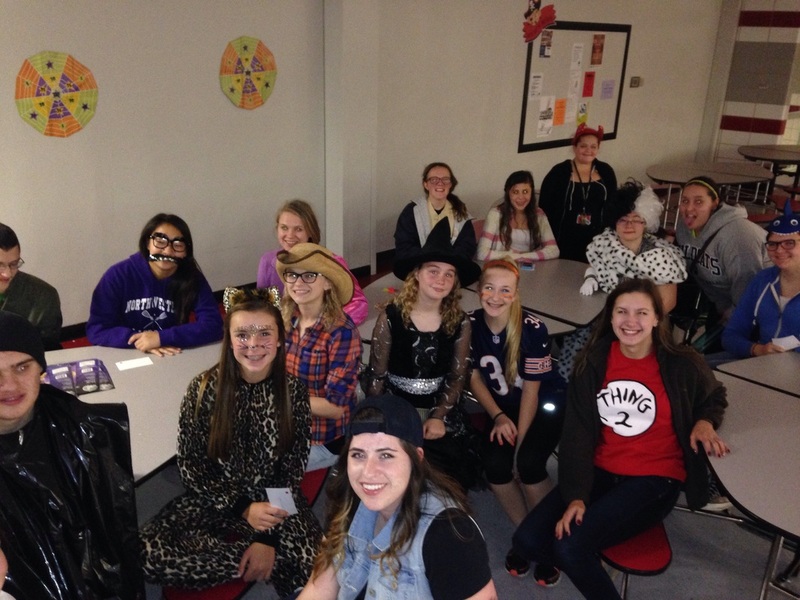 On October 20th, Best Buddies had our annual Halloween costume party! It consisted of some pretty great Halloween music, such as "Monster Mash" and "Flying Purple People Eater," two great classics. Not only was there some awesome background music, but we had mummy TP contests, pin the hat on the witch, cookie decorating, snacks, and more! Everyone truly had a blast! There were some pretty great costumes, too: Cruella Deville, witches, clowns, and even more spooky fun! The best part of this first event of the year is how the Buddy pairs (or trios, if you will) get to know each other. There was a skittle activity where you had to share basic facts about favorite things and family, and there was even a bingo game with candy corn. This past Friday, April 25th, was the ELS (Educational Life Skills) Prom. The dinner and dance took place at the beautiful Meridian Banquet Hall in Rolling Meadows. Many of our Buddies attended the event along with the Best Buddies student officers. Leading up to the dance, ELS staff at Palatine High School prepared the Buddies for the lavish occasion by styling their hair, and helping with ties. At the event, the girls were beautiful in their dresses, and the guys were very handsome in their formal attire. The dance was an opportunity for everyone to break out of their shells, and just have fun. The dance floor was a "Judgement Free Zone," where awkward dance moves were embraced. The DJ played a wide range of music that had the packed dance floor lifting their hands, shaking their hips, and moving their feet for hours. It was an honor to have been invited, and celebrate with such an awesome group of people. PS: Our final event of the year is coming up. It will be the “End of Year Banquet” at Durty Nelly’s on Tuesday, May 20th from 6:00pm-8:30 (Cost: $10). Dinner will be provided. The Best Buddies Friendship Walk is an annual fundraising event with multiple locations across the country. Participants walk for inclusion, friendship, and disability awareness. Since 2009, Best Buddies has raised over 2 million dollars through the walk (bestbuddiesillinois.org). This year’s event occurred at Stevenson High School on the afternoon of Sunday, April 13th. Palatine joined Stevenson, Vernon Hills, and a few other area chapters at the event. About a dozen PHS members made the trek up to Lincolnshire to walk, dance, cheer, and support Best Buddies. Our team captain this year, Alexa Hollenbeck (’15), set a fundraising goal of $1500 for our chapter. Prior to Spring Break, she ran a meeting for all of our peer, co-peer, and associate members outlining the ways they could fundraise, and how to signup for the walk. Kim Butler (’14), our Vice-President, frequently sent out “Remind101” text reminders to the members. Because of their efforts and the generosity of our members, their families, and people in the community we were able to achieve our fundraising goal. A BIG THANKS goes out to anyone who fundraised, personally donated, or attended the walk at Stevenson High School. 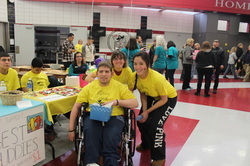 Palatine High School's 2nd Annual Cupcakes For a Cause Fundraiser was a huge success. Hundreds of cupcakes were sold with all of the proceeds going to support Palatine High School Special Education Programs, including Best Buddies. We were proud to see a large number of our Buddies and student mentors come to work and show support for the event. In addition to volunteering, we also had a few buddies perform. Karlee Darrow, a PHS student and Best Buddies Ambassador, spoke about her personal experiences with bullying. She encouraged the audience to use positive language, and challenged them to not be bystanders if they encounter bullying. 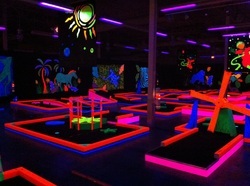 For our February event we went "Glow Golfing" at the Woodfield Mall. Half of the time was spent mini-golfing, and the other half was spent having dinner and hanging out in the mall. Buddies and Peer Buddies seemed to enjoy participating in an activity new to Best Buddies this year. Despite the slow start following Winter Break and two additional days off due to frigid weather, January was actually a month filled with a lot to be thankful for. First off, on January 17th, Best Buddies worked the concessions stand for the Fremd vs. Palatine Basketball game. In addition to the intense rivalry which drew people from throughout Palatine, it was also an ICompete night. This combination resulted in a huge crowd and a large sum of money donated to Best Buddies. The money raised from this fundraising event will primarily go to sending our four returning student officers, and our Buddy Ambassador to the Best Buddies International Leadership Conference in July. This month, instead of having a single group event, we organized separate "Guy's and Girl's Nights." It's was our first time trying an event like this. We organized the event so all of the guys would be going to a guy's house, and the girls would be split into two groups and go two separate girl's houses. The events turned out to be a huge success. Buddies had the opportunity to socialize outside of their normal pairings, and in the process, make new friends. It was an especially great activities for the boy buddies, eight of whom are paired with female peers. Hear All About It! 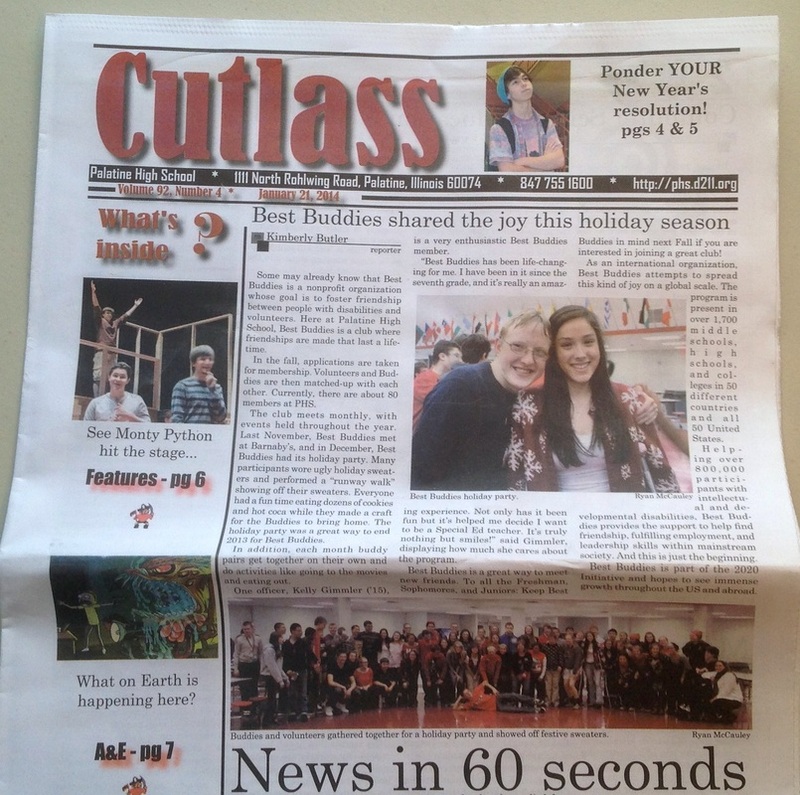 Best Buddies is on the front page of the Cutlass. "Some of you may already know that Best Buddies is a nonprofit organization whose goal is to foster friendship between people with disabilities and volunteers. Here at Palatine, Best Buddies is a club where friendships are made one year and last a lifetime. In the fall, applications are taken for membership and then students are matched up with each other. Throughout the year events are held monthly when the whole club meets. Last November we met at Barnaby’s. 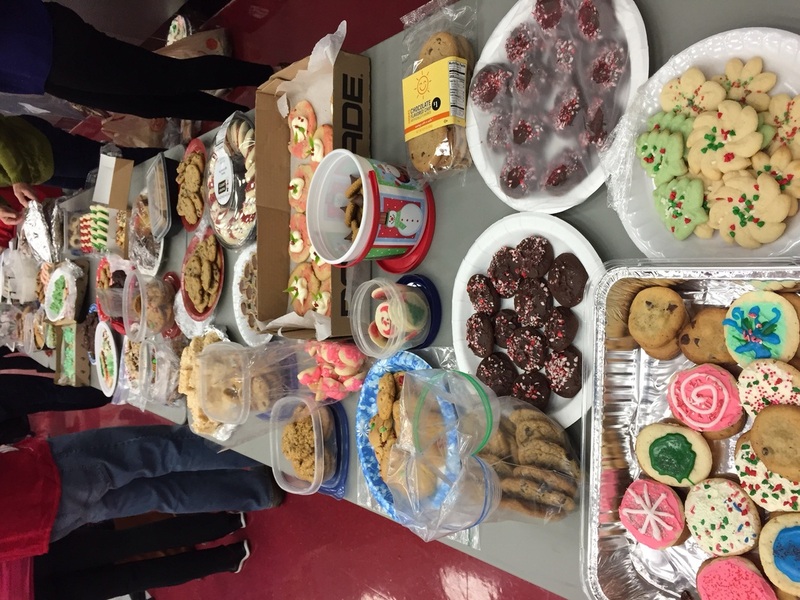 In December, Best Buddies had its holiday party. Many of the students were wearing ugly holiday sweaters and had a “runway walk” showing off their sweaters. Everyone had a fun time eating dozens of cookies and hot coca while they made a craft for the Buddies to bring home. The holiday party was a great way to end 2013 for Best Buddies. In addition, each month buddy pairs get together on their own and do activities like going to the movies and eating out. An officer, Kelly Gimmler, is a very enthusiastic Best Buddies member. She cares so much about the program when she says, “Best Buddies has been life changing for me. I have been in it since the seventh grade and it’s really an amazing experience. Not only has it been fun but it’s helped me decide I want to be a Special Ed teacher. It’s truly nothing but smiles (:“(Kelly Gimmler ’15). Best Buddies is a great way to meet new friends! To all the Freshman, Sophomores, and Juniors keep this in mind for next fall if you are interested in joining a great club." Hopefully this article spreads the word about Best Buddies. Great job Kim! The first few months of Best Buddies have been great. We have a record, 80 members this year. Our 44 Peer/Co-Peer Buddies have started building some genuine friendships with our 22 Buddies, and our 14 Associates have helped create an inclusive atmosphere at the group activities. So far, we've had the Matching Party, Barnaby's Pizza Party, and the Ugly Sweater Holiday Party. With these great events behind us, it's time to look forward to what second semester has in store. January Group Activity- "Guy's & Girl's Nights" Our idea for January is to have separated Guy's and Girl's nights. With so many members it's natural for Buddies to sometimes be overwhelmed at group activities, and as a result they often don't socialize outside of their Peer Buddy. We think this would be a good event, because it will mix thing up a bit, and hopefully encourage Buddy's to meet new people. Also, 8 of our boy Buddies are paired with female Peer Buddies, and we want to give these Buddies an opportunity to " just hang out with the guys." "Guy's Night"- Our idea for the guys night is to have all the boy Buddies, Peer Buddies, Co-Peer Buddies, and Associates to go to Ryan McCauley's house sometime in mid-January (after finals) to watch a Bulls game, play some games, and just hangout. (Alternative Activity) If the "Guy's & Girl's Nights" don't work we will go bowling as an entire group. January Fundraiser: Best Buddies will be in charge of the concessions stand at the Palatine vs. Fremd Basketball game, Friday January 17th from 6:30-8:00. Come cheer on the PHS Boy's Basketball team, and purchase some heart-healthy treats at the concession stand to raise $$ for Best Buddies. February Group Activity: "Pump It Up" Event/ Fundraiser. While at the BB Leadership Summit this past summer, I had the opportunity to meet and share ideas with other chapters. I spoke with officers from the Lyons Township High School, and they explained that they had a lot of fun hosting an event at Pump It Up. Pump It Up is a giant inflatable party place, with the closest location in Schaumburg. What's also great about Pump It Up is that they are supporters of "Autism Speaks," and are willing to help us use the event as a fundraiser to send our current officers for training at this upcoming summer's International Best Buddies Training Conference.